A history has been made in the interior town of Maslog, Eastern Samar after 164 couples received the Sacrament of Matrimony in the Parish of St. Isidore the Farmer on November 29, 2018. Witnessed and officiated by Bishop Crispin Varquez, together with Fr. Clyde Cabueñas, the parish priest, and Cyrain Cabueñas, the mass wedding was held inside the parish church. 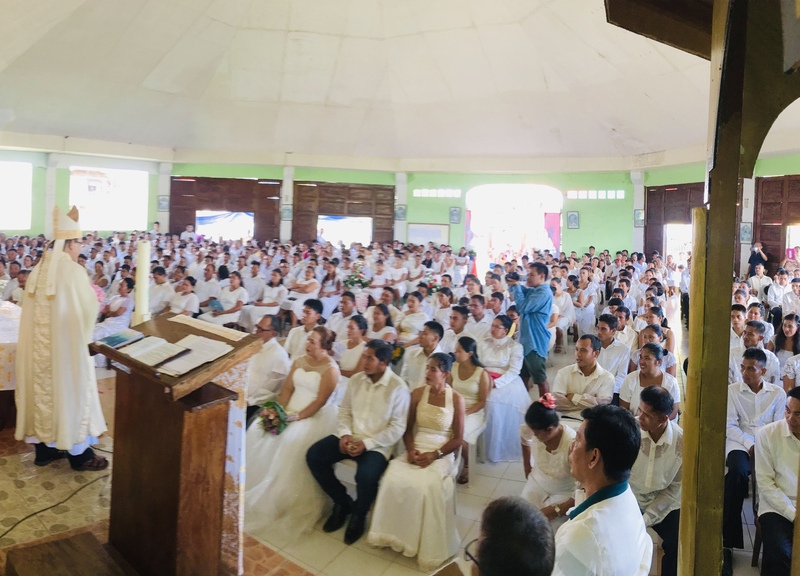 Bishop Varquez said that this is the biggest number of couples in a mass wedding that he officiated for the past 30 years in his priestly ministry. “You will be part of the history of Maslog and the diocese,” he said. Fr. Clyde Cabueñas said that he was just expecting 25 couples, but the number got bigger until 164 couples registered in the parish. The mass wedding was the initiative and concerted effort of the parish pastoral council in cooperation with Maslog LGU. A wedding reception followed at the town’s auditorium.